Raise your hand if you could use a vacation. I could! 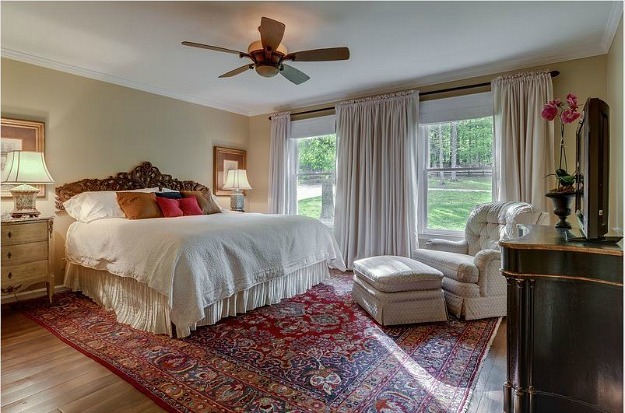 And this country farmhouse–a vacation rental near Franklin, Tennessee–looks like a lovely place to take a breather. 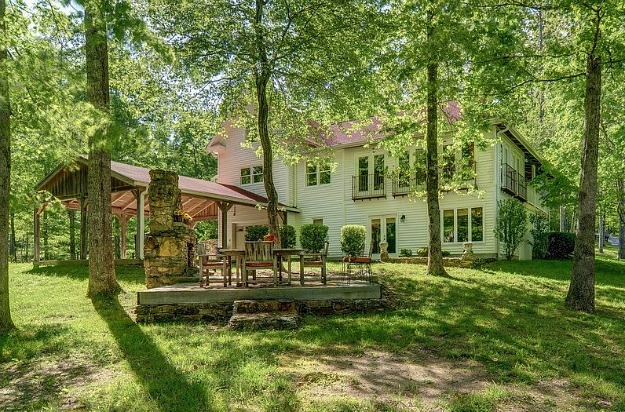 It sits on 41 secluded acres with a pond down the road from Historic Leipers Fork Village. Have you ever rented a house for a family vacation? We love staying in houses when we’re in Tennessee. There are 3 bedrooms and 3 baths, and the house can sleep 6-10 people. 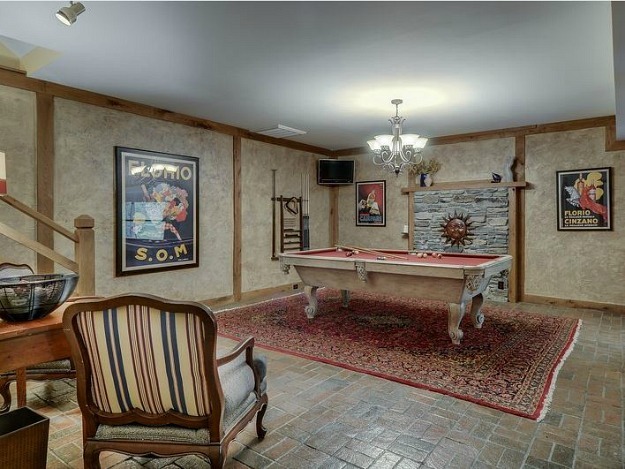 What would a vacation home in Tennessee be without a pool table? It’s always at the top of my husband’s list when we’re looking for a place to stay. 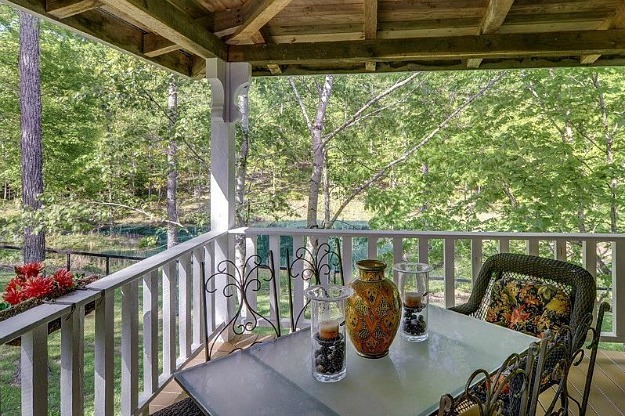 I’d be spending as much time on the porch as possible. Gorgeous! I can almost hear the birds chirping and the summer wind blowing through the trees. 🙂 That wrap-around sun porch is incredible! I’m sure Sarah’s guests never want to leave! Absolutely beautiful. Inside & out. 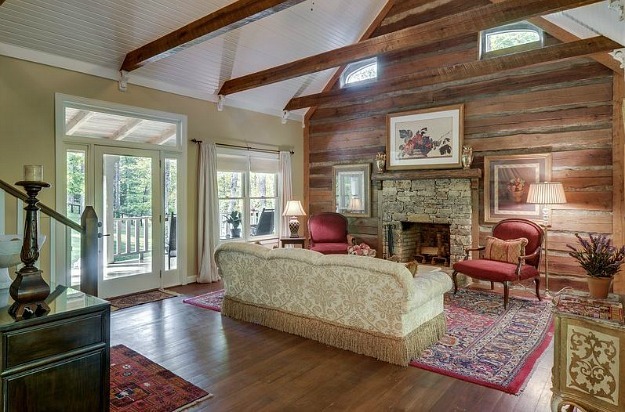 Love the exposed logs & stone fireplace on the inside as well as the outdoor fireplace. 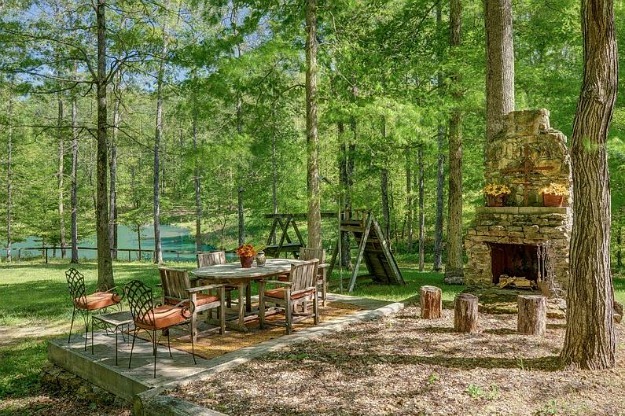 The tranquil setting from the porch to the pond is so beautiful. 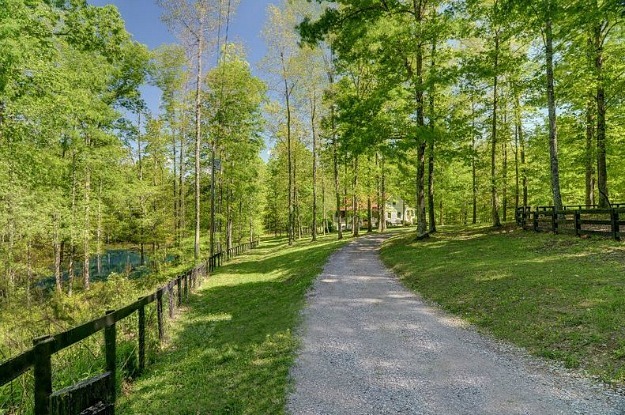 The long winding driveway into the property is leading into a little peace of heaven. So lovely. Oh I love it! 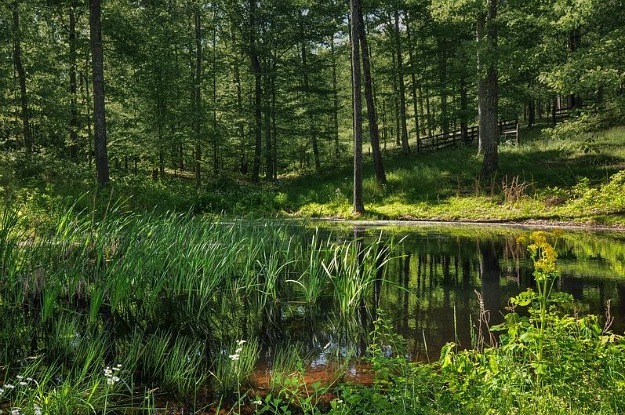 Tennessee is so beautiful and green…. and what a great house! I could see how kids would really enjoy it there too! Stunning and serene! 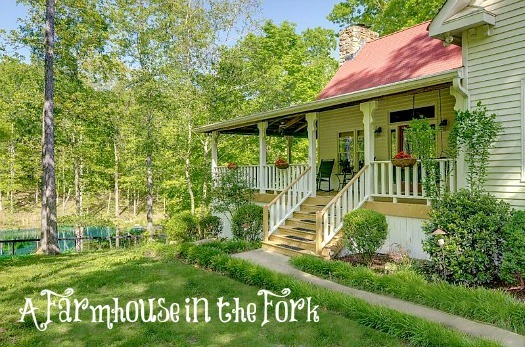 From the wonderful woodlands outside to the warm woods on furniture and kitchen inside, this farmhouse is a haven away from home and an idyllic venue for a relaxing vacation! Love, it! I read your blog almost everyday but this entry..oh my…. I love this house.. it is so comfy.. I could live there.. Thanks for sharing. This looks like an idyllic place to stay. I’d like to be there right now (instead of working!) My husband an I always try to stay in a house or apartment on our vacations. We’re staying in a beautiful apartment in Paris and a cottage in Provence this summer, both found on VRBO. Can’t wait! Lucky you! That sounds wonderful. Thank you Julia. I’ve been wanting to do this forever – I am beyond excited!!! What a place to get away from it all! 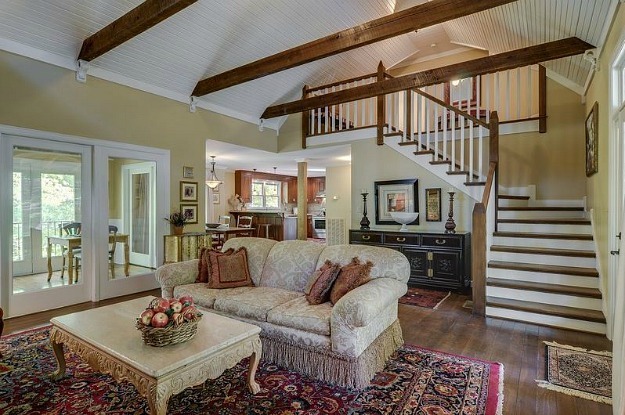 The house has such a casual elegance to it. We have been to Franklin, TN several times and its such a beautiful little town with some really neat shops and restaurants. I was going to ask what there is to do there? What’s the nearest big town? 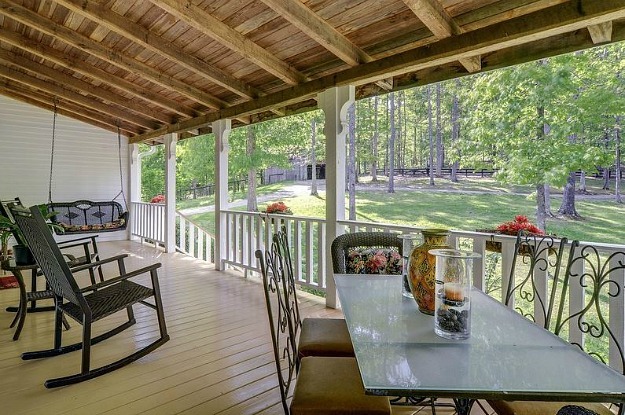 Vacationing in Tennesse is about slowing down doing a lot of porch sitting. We might be part of the Bible Belt, but those of us who live in this part of the country refer to it as the Rocking Chair Belt 🙂 If you need a faster pace you can head 25 miles or so north to Nashville. Easy drive there and tons of nightlife and other activities. I love that wrap around layout inside – and the outdoor patio & fireplace is something to look forward to every night! What a great blend of style too. From the rustic woods to the traditional decor! Thanks for posting – makes me want to plan a trip! Wonderful house. It looks so relaxing. Sarah describes it so well. If I ever sell my house I’ll look her up to write my description for my listing! 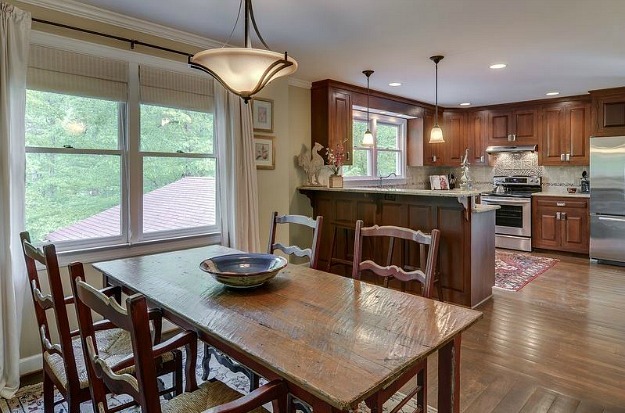 Like it a lot, but to bad the kitchen isn’t in keeping with the style and the era of the house. I want to be Wyatt. What an absolutely fabulous house! That porch is to die for. Lovely. Just lovely. What a peaceful house to enjoy. 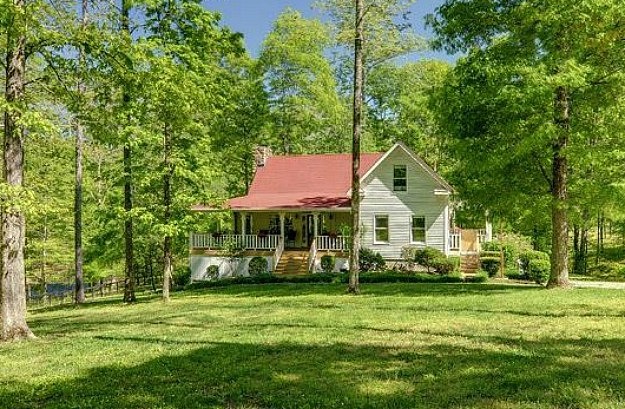 We are headed to Leiper’s Fork this summer, but since it will just be my husband and myself, a house is more than we need. With that said, should we ever need a house, this would be the one! We stayed in another one of her houses and it was the most amazing stay we have ever had! Tennessee is beautiful and her vacation home just really adds to the experience. What a relaxing serene place. I love the surroundings and the house. If I stayed here I would never want to leave. Leipers Fork, TN is also home to Naomi Judd, and her daughters, Wynona and Ashley. Each of them own property there only a short distance from one another. The town was occasionally featured on their reality show called The Judds, which aired on OWN-TV (Oprah Winfrey Network) in 2011. Ok, that place is GORGEOUS! Really well maintained, lovely vacation home. We always stay in homes when we vacation, but we’re more the beachy types. If this type of vacation was in our plans I think it would absolutely fit the bill! OK. I’m crying. I have to stay here, then I can die happy. What a heavenly place! Thanks Julia!! Now, if I can round up my family who all want something different and all have different schedules. Know what? I don’t care. I’m there! This would be heaven, especially the land and pond. Oh, wow, my cousin lives in Franklin…I was so glad to see this post. Thank you! That is so beautiful! I love the woods and mountains as much as the beach, maybe more. It’s so peaceful and green. Gorgeous.. This entire house and the land are gorgeous. I would definitely live there. Hi Julia the word I’m looking for to describe this beautiful place is delightful…… The land is vast and stunning. I imagine myself sitting in that porch 24/7 sigh……. Thank you for sharing till next time Regards Esther from Sydney. PS sure would be nice to be there right now. Lovely farmhouse and beautiful location. I’d want to watch the river otters. 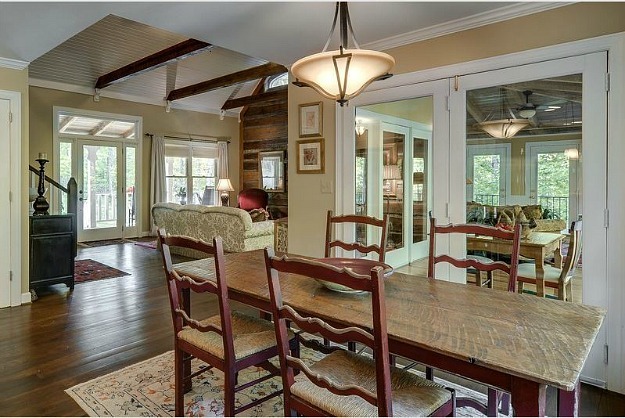 The formality and fussiness of some of the furnishings seem out of sync with the rustic/country character of the house and setting, though, especially for a vacation house. 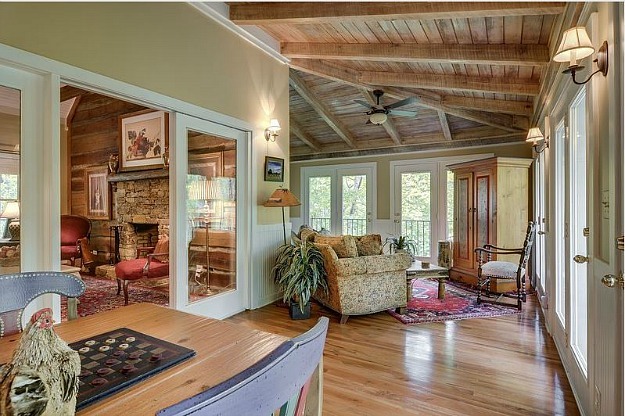 This is a Tennessee farmhouse, not a French or Tuscan villa. Gorgeous. So homey. I want to live there.